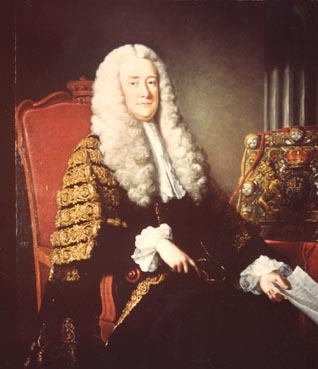 It was during 1753 that Lord Hardwicke addressed the Houses of Parliament, proclaiming the necessity to make 'irregular' marriages illegal and to bring marriage under the regulation of the church. The result of this was the 1754 Marriage Act - the wedding ceremony now had to take place in Church and couples had to be 21 years of age to marry without the consent of their parents, previously no consent was required if you were above the age of 16. Hardwicke's Act was introduced in order to try to bring control into the many irregular marriages that were taking place all over Britain, often involving seduction, bigamy and fraud. One of the most notorious of those places was the Fleet Prison in London. On the day before this new law came into force, 26th March 1754, there was a rush to beat the deadline and it is recorded that 217 weddings took place at Fleet Prison and its surrounds! Scotland's refusal to adopt the Act created a loophole for youngsters determined to marry. Scots and English Law Lords debated the issue for 186 years before the Scots relented and outlawed 'handfasting' ceremonies but this was a legally binding marriage ceremony until 1940.